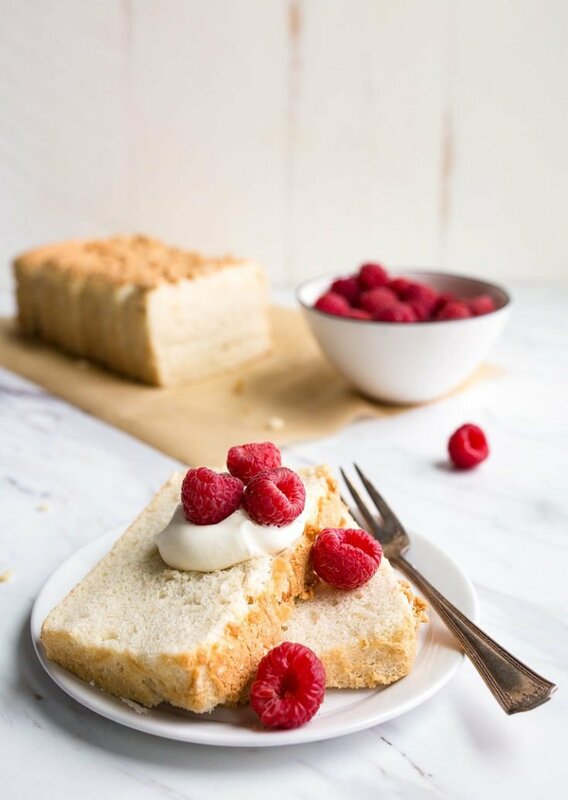 Mini angel food cake made in a loaf pan for fewer servings! Small angel food cake for two! You’re looking at two slices of my all-time favorite and death-bed dessert: angel food cake. 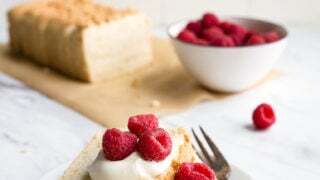 But not just any angel food cake: a mini angel food cake made in a loaf pan, doused with freshly (barely-sweetened) whipped cream and fresh raspberries. I’ve always loved angel food cake, even the store-bought variety. The boxed mix isn’t too bad either because you can’t deny the convenience of not having to separate one dozen eggs. In this case, I made several batches of my small cheesecake recipe made in a loaf pan for a recent book signing I did in Dallas, and so I had leftover egg whites. I also made many batches of my small-batch sugar cookies, too! Whenever I acquire the magical number of seven leftover egg whites, then I make this small batch angel food cake. Side note: If you’re interested in living la vida small batch desserts, I have separate every single recipe on this site into recipes that use egg whites and recipes that use only egg yolks. You can always find these categories on my recipe index page, just in case you need to bookmark that. 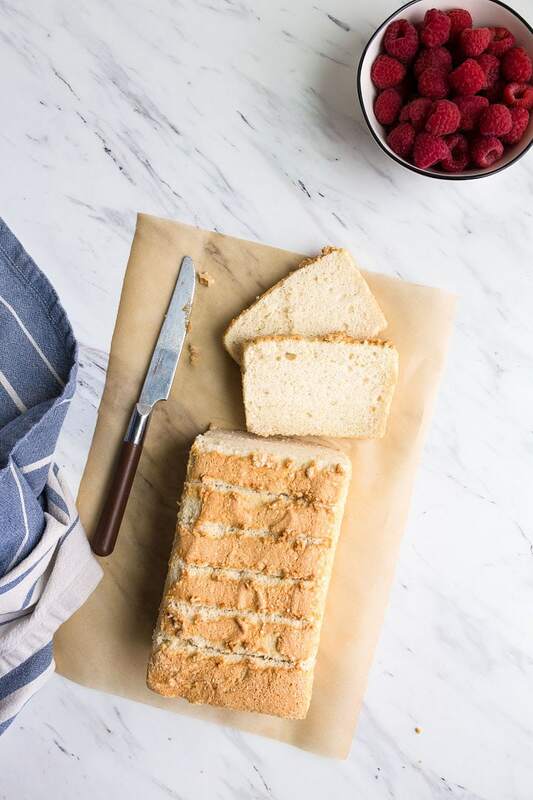 This mini angel food cake is made in a standard 9″ bread loaf pan, and it has a few non-negotiable steps. You must use a regular pan, not a non-stick pan. The cake needs to stick and climb up the sides of the pan in order to reach its full height potential. Do not, I repeat DO NOT grease the pan. If your loaf pan is non-stick, it won’t work! Use a metal, plain loaf pan. I promise the cake will come un-stuck later when you’re ready to serve with a simple knife run around the edges. You must beat the egg whites to soft, floppy peaks, and not any further. The cream of tartar is optional; leave it out if you don’t have it. When I use it, my mini angel food cake rises higher but then it also cracks (which is totally fine, too). You must cool this cake upside down, as shown below. If not, the cake might sink or deflate. Serve slices with whipped cream, my microwave lemon curd and fresh berries. Spread two slices with jam and stick it in a kid’s lunch box for a fun dessert. Dip leftover pieces in custard and cook like French toast for breakfast! If you own my cookbook Sweet & Simple: Desserts for Two, you’ll recognize this as the angel food cake with jam. In the cookbook, I sliced this cake horiztonally into 3 sections (it’s best to use an electric carving knife for this), spread it with jam, and then stacked it back together, tightly wrapped it with plastic wrap and left in the fridge for 6 hours. 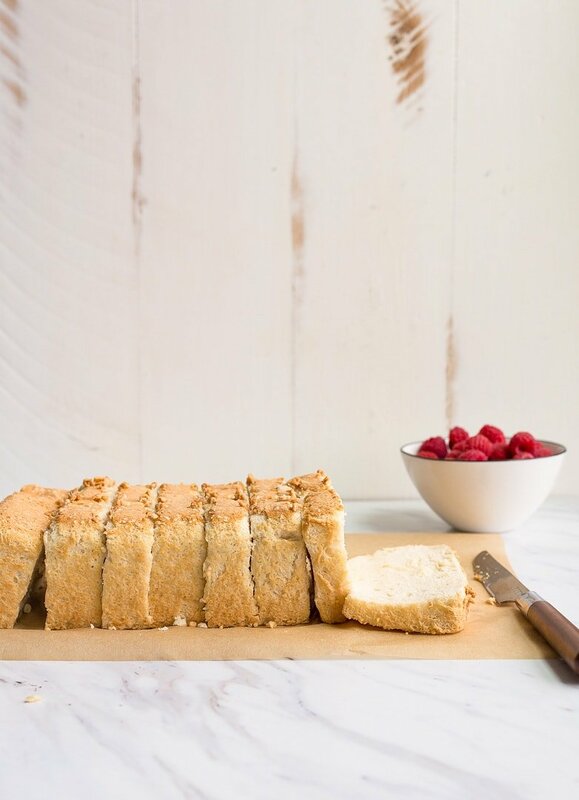 Small batch mini angel food cake for one or two people. Made in a loaf pan! Preheat the oven to 325, and have a 9" bread loaf pan ready. Ensure it is not non-stick. Do not line or grease the pan in any way. Trust me! In a small bowl, whisk together 1/4 cup of the sugar, flour, and cornstarch. Set aside. 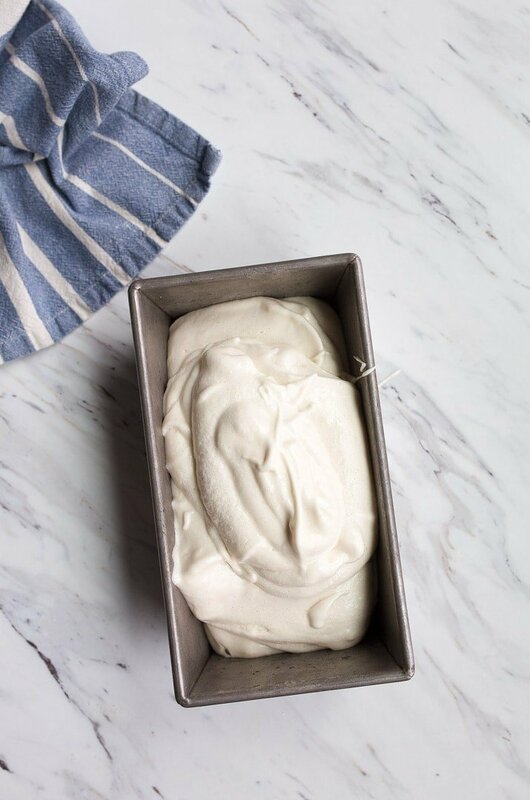 To the bowl of a mini stand mixer, add the egg whites, vanilla, cream of tartar (if using) and salt. Beat on medium speed until foamy, about 30 seconds. Slowly stream in the remaining 1/2 cup of granulated sugar, one tablespoon at a time while the mixer runs. Continue to beat on HIGH speed until soft, floppy peaks form, about 4 minutes. Next, add 1/3 of the dry ingredients and fold them into the egg whites using a rubber spatula gently. Proper folding technique is down the middle and around the sides. Your goal is to incorporate the flour mixture without deflating the air you just whipped into the egg whites. Pour the batter into the loaf pan. Place the loaf pan on a baking sheet, and bake for 38-42 minutes. The cake is done when the top is no longer sticky to the touch, and if it cracks (mine didn't this time), the cracks won't be sticky either. Once the cake comes out of the oven, immediately turn it upside down and invert it over two cans (see photos). The cake needs to cool upside down so it doesn't deflate. Let it cool for at least 60 minutes. 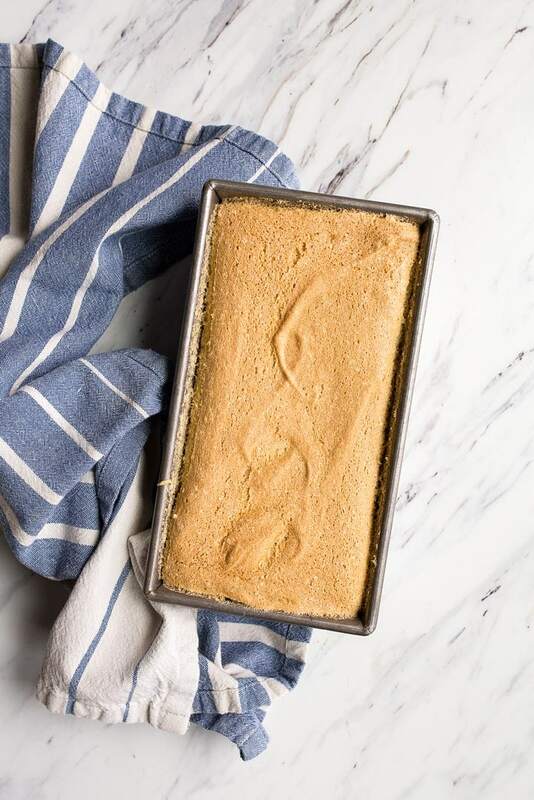 Once the cake is cool, run a knife around the edges of the pan and gently let the cake fall onto a cutting board on its side. Use a serrated knife to slice the cake into even slices. I used a serrated knife to get the cut started, and then finished the cuts using a sawing motion with a regular very sharp knife. Go slow, don't smush the cake while slicing. Serve with whipped cream and raspberries. *If you don't have cream of tartar, leave it out. The cake won't rise as high, but it will still taste great! i think baking cakes in loaf pans is my new favorite thing. so simple. yet chic. I’m so glad you mentioned french toasting it! I’m always on the lookout for angle food cakes at the store that were baked in loaf pans because it’s easier to french toast them than the big bundt ones. Now I can just make it myself when I can’t find any! Yay! This looks great, I can’t wait to try it! I know you mentioned some of your recipes that use a leftover egg yolk, but I was wondering if you had any recipes that would use all 7? Thanks! I make it in Mimi loaf pans (3), my husband would eat the whole thing when I use a large loaf pan. SO to keep him from doing that I make (3)Mimi one’s and freeze two. I can’t believe you consider cream of tartar optional. *sigh* It’s okay, I love you anyway. Would everything be ruined if I tried angel food cupcakes? I’ve made it in little ice cream cones with confetti. The ones that will sit in a muffin tin to stay upright. This was a great recipe. My husband said it was the best he has ever eaten and he LOVES angel food cake. I try to make it for him on his birthday. I will be making this again and again. Thanks for your inspirations. Do you use the 7 egg Whites from the same day eggs? or is it OK to put the eggs aside in a covered container till I collect them. I’ve heard its OK to freeze egg whites. Have you ever done that? thanks. I freeze egg whites all the time. Place in a mini zip lock bag! Sorry, should have said: egg WHITES aside in a covered container. Hi….the only “metal” pan I have is a mini loaf with 6 wells, by Wilton. Would this work? All my other regular pans are USA, treated with silicone. I loooove angel food cake but a full size is always too much!! this is PERFECT! 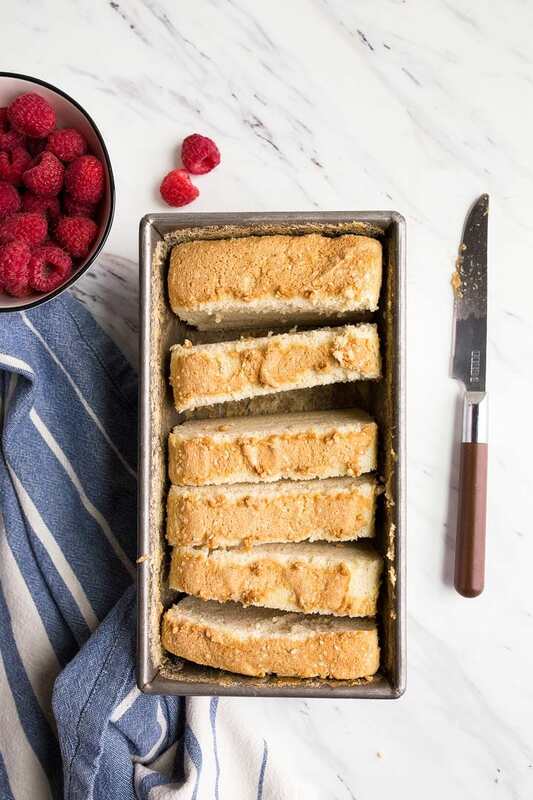 Can you make this with almond flour so that it’s gluten free or does it really need the gluten? Did you try it gluten free? Did it turn out ok? Angel Food cakes often use cake flour. If I have it, does it enhance the cake? 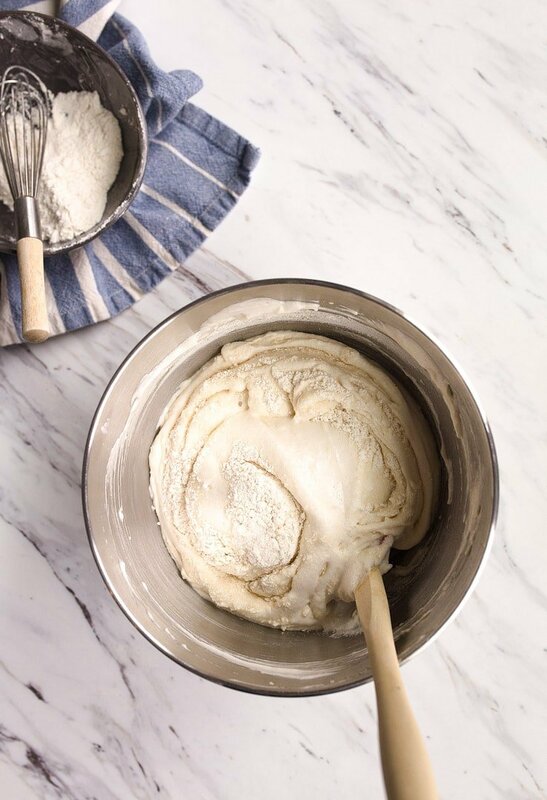 The addition of corn starch to the flour is how you make your own cake flour. I generally sift them together a couple of times and store airtight. So I’d say, if you’re using premade cake flour, skip the corn starch. Ugh, I’m sorry, Ri. This is SO odd. I don’t know why. It makes me think it’s egg quality? Did you use vanilla or almond extract at all? I know 2 teaspoons doesn’t sound like a lot, but it really does impact the flavor. I have made this cake with excellent results using Cup 4 Cup gluten free flour. 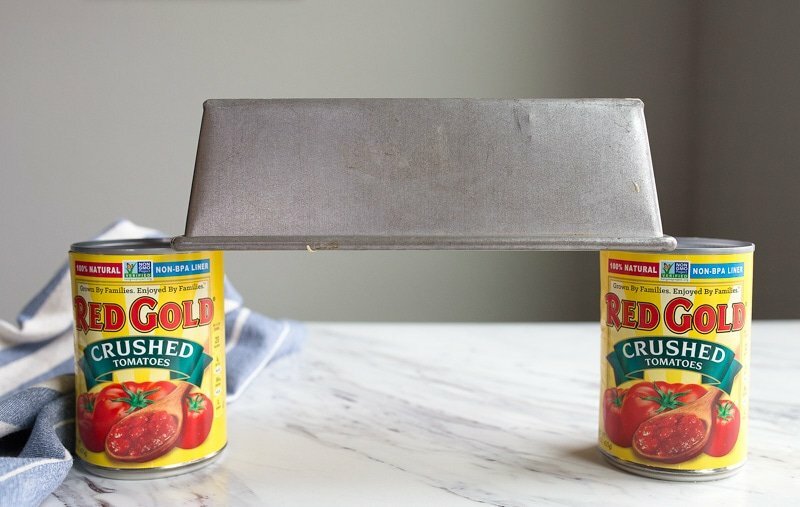 Can this recipe be converted to the mini angel food pans?